Since you've come to the emergency forum, we know you want a fast answer to your question. In order for us to figure out the problem as quickly as possible, we ask that you answer the following questions. Some of them may seem odd, but they're all designed to give us the information we need to give you a good solution for your problem. Thanks! 5. What kinds of food do you feed and how often is it replaced? Daily, variety of mostly fresh organically-grown leaves, fruits, veg, egg, eggshell, various shrimp and dried fish, river shrimp, mealworms, nuts, coconut, peanut butter, sometimes cereal, bread, pancake, all whole-grain organic, etc. 16. Please describe the emergency situation in detail. Medium sized PP is out of shell, but goes back in a little when I mist the tank. Found it like that this am. Has been listless, not eating last couple of days. I've put a bunch of shells around it. I don't have time to read entire post, I'll do so when I get off. But here's a pic of my purple pincher in a surface molt during our move for reference. The piece laying next to his shell is his exo. He's inside the shell. He eventually ate all of his exo and is doing well! I'll post more info when I get off work and able to read thru your answers! Just wanted to give you a reference point. I'm not seeing anything that would have triggered a surface molt, which is good. Is he hanging out of his shell, or is he completely out and naked? It could be a surface molt or he might be dying. It doesn't sound like anything was done to cause a problem, but sometimes they sustain a lot of damage that doesn't catch up to them until a few molts have happened. I would suggest isolating him away from any of the other crabs just in case for safety, and keep doing what you're doing. Honey or peanut butter would be good to offer in case it's not a molt. Thanks for the responses; he's still hanging out of his shell almost completely, but responds by moving a little when I mist the crabitat. No other crabs are up right now, but I will isolate him with some pb and honey. I've got some moss I can put around him for a little more protection and humidity. He needs to be reshelled. Try gently backing him into a shell. Rinse out the shell first and gently rinse him too. GB: Is it moistened with dechlorinated msw or dechlorinated fw to make it sandcastle consistency? Option a: Costs more, less work: Reflectix insulation (looks like a car shade) sold at Walmart/Lowe's/Home Depot - $14 roll: Cut to size - hang with packaging tape/duct tape/reflectix tape. Option b: Cheaper, more work: Aluminum foil (shiny side facing inside the crabitat), then cardboard or styrofoam. may repeat layer of aluminum foil and cardboard or styrofoam if needed. GB: I personally recommend that you use tap water and then a dechlorinator that removes chlorine, and chloramine as well as neutralizes ammonia and heavy metals. A lot of us use a product called Prime. You have to use the dechlorinator for both freshwater and marine saltwater. Both pools should be deep enough for them to fully submerge in and safe enough for them to get out of. Distilled has no minerals in it whatsoever. GB: Make sure you cover all aspects of food pyramid Foods should be organic when possible. 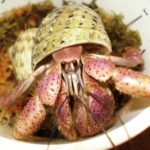 Hermit crabs are sensitive to pesticides and fertilizers. GB: It is not necessary to replace the substrate UNLESS you have a bacterial bloom. GB: Be careful with misting: It can lead to flooding. If you must mist - mist with dechlorinated fw. Don't spray crabs. It really sounds like this little guy is in a shell but only weakly hanging onto it. I've seen this before and when they're this week they won't stay properly shelled. I'm not sure messing with him and his shell is the right thing to do here. How is your crab doing today? Thanks for all the helpful information and ideas! He/she seems to be doing better now, eating and staying more in shell. I haven't wanted to move her/him much. Last time this happened with another crab, I think the rinsing and handling may have been too much as our crabs are not handled regularly, and the poor crabby died. Plenty of all the good stuff to eat around, full pyramid and all organic. I use only distilled water for misting and wetting the substrate, but can add trace minerals to it. Substrate is sandcastle consistency. I'll try some more insulation and continue to monitor for flooding. I've also been blowing him/her little kisses. Finger crossed she/he keeps getting better!